During this presentation, Elvis will provide an overview of two of the most popular Esri mobile apps for data capture – Collector and Survey 123. Topics covered will include guidelines on the appropriate use cases for each of the apps and also interaction between the two apps through portal. Knowledge of web GIS fundamentals (web map, sharing, groups etc) would be beneficial but not required. 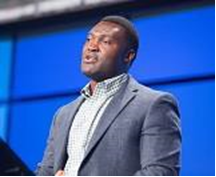 Elvis Takow, PhD is a solution engineer in the natural resources sector of Esri. At Esri, his responsibilities as a solution engineer involve proactively crafting and proposing solutions that clarify how GIS brings business value to the critical challenges faced by customers in their day to day work endeavors. Elvis has a PhD from Texas A&M University in Ecosystem Science & Management with an emphasis GIS. His background involves research and development in the area of landscape ecology with specific interests in spatial data analysis and the customization of GIS applications for problem solving especially in ecologically based systems and agriculture.